Red Bull has taken a different approach to KERS, a technical report in Germany’s Auto Motor und Sport has revealed. The otherwise-dominant team has struggled with the technology so far in 2011, and is using the three-week break before Turkey to try to fix the problems. "If I’m honest," said designer Adrian Newey recently, "I would rather not have KERS on the car." 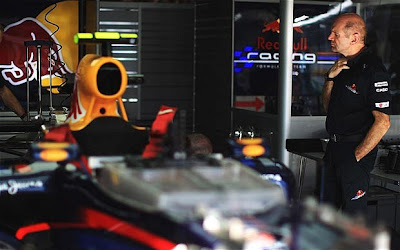 The Briton was also quoted as saying Red Bull is in a "learning phase" with its system, amid suggestions Mark Webber and Sebastian Vettel have been banned from talking about KERS or any specifics of their difficulties. "Actually I don’t know (what’s wrong)," said Australian Webber in Shanghai, "and honestly I don’t really care either. I just want it to work!" Auto Motor und Sport said the foundation of Red Bull’s KERS is the Renault system, but it differs in design by 40 per cent to the base unit, which has functioned in the Lotus-Renault essentially without drama so far in 2011. The report said Newey has packaged KERS unusually compared to the bulk of the field, for example by placing some components to the left and right of the gearbox. In comparison, Renault’s KERS is under the seat, while Red Bull’s has suffered from vibration, high temperatures and software glitches.